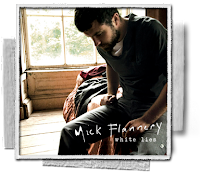 I went to see Mick Flannery play in the Lodge in Mallow recently. The Lodge is a great venue, not sure that the seating layout was the best on this occasion but other than that it’s a good place to go and see bands. Mick played a good selection of songs from his new album ‘White Lies’ and from his previous album ‘Evening Train’. I’m becoming quite addicted to his song ‘Safety Rope’ which is the first song on the new album. It’s great to hear his single ‘Tomorrow’s Paper’ being played regularly on the radio. I hope there will a couple of more single’s from this album too.